Clove is a species of tree that has a large tree trunk and hardwood, cloves survived dozens, even hundreds of years, can reach 20-30 feet high, and its branches is quite dense. Branches of the cloves plant are generally long and filled with small twigs that are easily broken. Crown or also commonly called tree canopy cloves . Green leaf clovers elongated oval with an angled tip and base part, have an average size of around 2-3 cm width and length of the leaves without stems ranged from 7.5 to 12.5 cm. 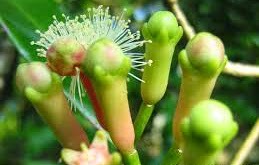 Flowers and fruits cloves will appear at the top branches of leaves with short stalks and have bunches. By the time young clove colored clove flowers, then turns yellow-green and turn again to pink when they are old. dried cloves flowers will be colored dark brown and tasted spicy because it contains essential oils. Generally cloves fruitful first time, at the age of 4-7 years. 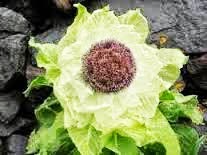 This plant will grow well when sufficient water and get direct sunlight. In Indonesia, cloves suitable to be planted in low lying areas near the coast and in the mountains at an altitude of 900 meters above sea level. Cholera, blacken the eyebrows, increase heartbeat, against measles. and increase the number of white blood. Material: 10 pieces of clove flowers and sugar cubes. overnight, then added with sugar cubes and stir. How to use: drink little by little. How to use: chewing, drink the the juice. Ingredients: 5-7 dried cloves flower and hazelnut oil. How to make: Flowers cloves burned until charred, then ground into powder and plus with hazelnut oil sufficiently. How to use: Applied on eyebrows every afternoon. Clove flowers besides contains essential oils also contain a chemical compound called eugenol, oleanolat acid, acid galotanat, fenilin, karyofllin, resins, and gums.